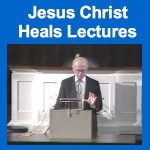 If today I found out that I or someone I love was seriously ill, the first thing I would do is to carve out three hours to watch Ed Rabel's lectures on Jesus Christ Heals. These talks are "Spiritual Healing 101" at its best. From there I would listen to Martha Smock speak about the Healing Ability and listen to May Rowland's Healing Workshop. Martha and May will open my heart, but Ed's lectures would come first simply get my analytical head screwed on straight. So here are four lectures, given at Silent Unity Chapel, by Ed Rabel explaining what Charles Fillmore wrote about spiritual healing in Jesus Christ Heals. These videos came to me from a long-time Unity student who lent them to me. I've never seen them in the Unity Library and Archives. I have no doubt that somebody, somewhere, sometime, will have their healing capacity opened by watching Ed's talks. Many thanks to you, our friend, for preserving and sharing this powerful treasure. The transcripts for these talks were contributed by Mary Salama. They are wonderfully done. It's not easy transcribing Ed Rabel—he jumps around mid-sentence. But Mary has captured Ed Rabel's words and spirit in a ways that conveys his genius to us. Thank you, Mary! You can have a well body.